The proposed legislation passed in the Seanad last week after opposition parties joined forces. 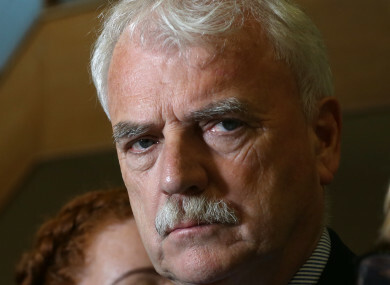 The Minister of State with special responsibility for disabilities, Finian McGrath. FINE GAEL GOVERNMENT ministers and Independent Alliance members at Cabinet are divided over a Bill which calls for a trade ban on goods and services from illegal Israeli settlements. The proposed legislation passed in the Seanad last week after opposition parties including Labour, Sinn Féin, Fianna Fáil as well as independent senators joined forces to support the Occupied Territories Bill 2018. The government opposed the Bill and lost the vote. The Bill will now make its way to the Dáil for approval. It is understood that members of Cabinet such as Junior Ministers Finian McGrath and John Halligan expressed their support for the Bill at the time, but ultimately toed the line. Since the progress of the Bill, there have been reports from government sources that it will do everything in its power to block the Bill. When asked by TheJournal.ie today if members of the Independent Alliance will be seeking a free vote on the Bill, McGrath said they would make a decision on that issue in the autumn. He said he has been in talks with Tánaiste and Foreign Affairs Minister Simon Coveney during the week about the proposed legislation. During those talks, McGrath said it has become clear that the government has a major problem on its hands due to their divergent viewpoints. We will be sit down over the summer period and discuss it. We have aspects of our foreign policy in the programme for government. I know from talking to Simon [Coveney] that that will be implemented. But in relation to that particular legislation coming through the House we will continue on talking to the Tánaiste and getting advice and support and the Independent Alliance will make a decision in the autumn. The Israeli Embassy in Ireland has been highly critical of the Bill. Seanad Éireann has given its support to a populist, dangerous and extremist anti – Israel boycott initiative that hurts the chances of dialogue between Israel and the Palestinians; it will have a negative impact on the diplomatic process in the Middle East. Speaking about her Bill, Senator Frances Black said Ireland should oppose war crimes, no matter where they’re committed, adding that the settlement project in the West Bank is “grossly illegal”. She said it was not good enough to condemn the Israeli actions, and then “ask how much for the eggs”. Black said there is a “deep hypocrisy in that” adding that the passing of her legislation would send a powerful international message. Email “'A major problem': Independent Alliance to decide on free vote for Israeli goods trade ban Bill in the autumn”. Feedback on “'A major problem': Independent Alliance to decide on free vote for Israeli goods trade ban Bill in the autumn”.